29/05/2019 RUSTY Challenge Tournoi des Jeunes Royal Uccle Sport OUTDOOR . . . . . . .
30/05/2019 RUSTY Challenge Tournoi des Jeunes Royal Uccle Sport OUTDOOR . . . . . . . .
30/05/2019 Challenge Léopold Dumont Royal Léopold Club OUTDOOR . . . . . . . .
31/05/2019 Challenge Léopold Dumont Royal Léopold Club OUTDOOR . . . . . . .
01/06/2019 Tournoi Wild West Braxgata H.C. OUTDOOR . . . . .
01/06/2019 Challenge Léopold Dumont Royal Léopold Club OUTDOOR . . . . . .
02/06/2019 Challenge Léopold Dumont Royal Léopold Club OUTDOOR . . . . . .
02/06/2019 Youth Tournament Hoegaarden OUTDOOR . . . . .
02/06/2019 Tournoi Wild West Braxgata H.C. OUTDOOR . . . . .
08/06/2019 RUSTY Challenge Tournoi des Jeunes Royal Uccle Sport OUTDOOR . . . . . .
08/06/2019 Jeannine Speleers Jeugdtoernooi KHC Dragons OUTDOOR . . . . .
09/06/2019 RUSTY Challenge Tournoi des Jeunes Royal Uccle Sport OUTDOOR . . . . . .
09/06/2019 ECLAIR CUP Eclair Hockey Club OUTDOOR . . . . .
09/06/2019 Jeannine Speleers Jeugdtoernooi KHC Dragons OUTDOOR . . . . . .
10/06/2019 Pinkstertornooi Neo Hockey Mechelen OUTDOOR . . . . . . .
21/06/2019 GREENWIN RASANTE OUTDOOR . . . . . . .
22/06/2019 HockeyRockers KHC Leuven OUTDOOR . 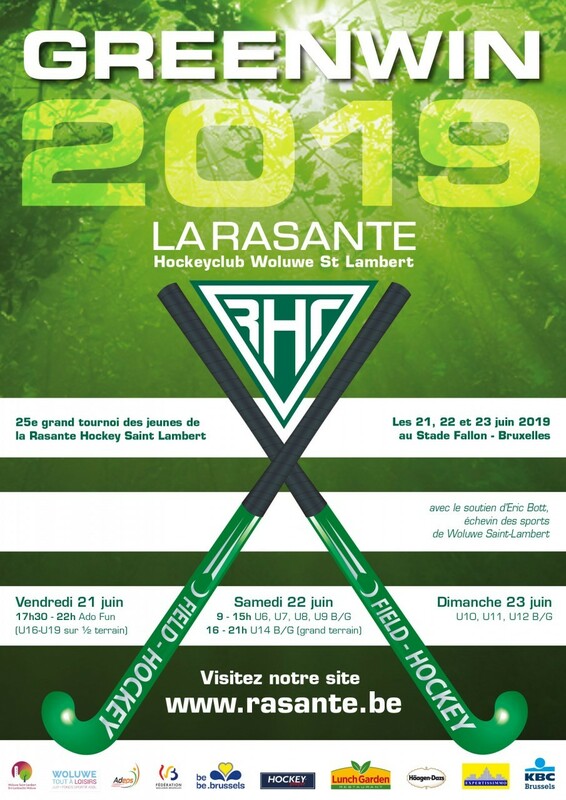 . . . .
22/06/2019 CHALLENGE PINGOUIN Tournoi des jeunes PINGOUIN OUTDOOR . . . . . .
23/06/2019 GREENWIN RASANTE OUTDOOR . . . . . .
23/06/2019 HockeyRockers KHC Leuven OUTDOOR . . . . . .
31/08/2019 Tournoi des Jeunes 2019 Parc Auderghem Hockey Club OUTDOOR . . .